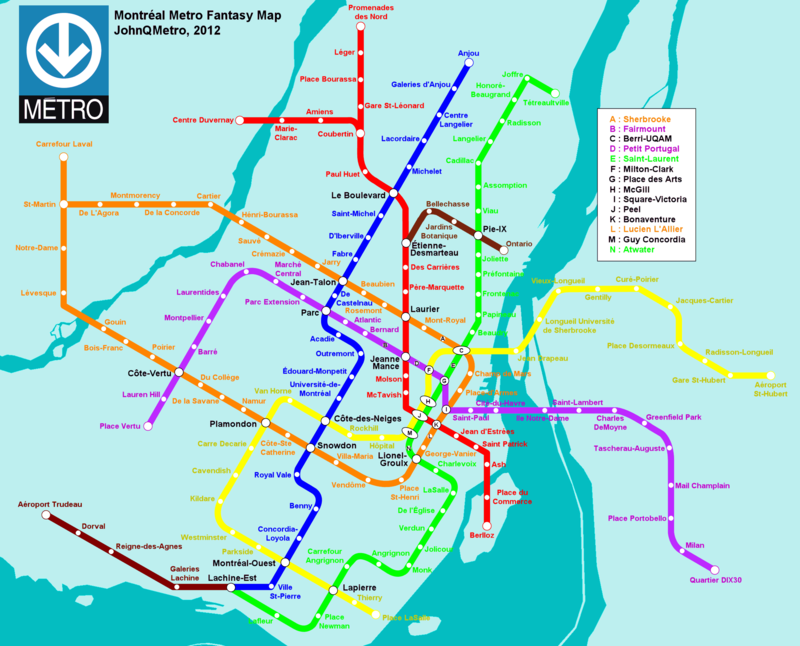 The Montréal Metro is a 100% underground Rubber-Tyred metro in Montréal, Québec, Canada. It currently has 4 lines (one of them very short), and has a high ridership for a North American metro, coming in (according to Wikipedia) third after New York City and Mexico City. Here is the current Metro Map from the STM. For my own fantasy map (you can click on it to get the full sized version), I am still assuming underground metro — this map does not include any possible trams, light rail, commuter rail, or any assumption that surface rail will be converted into metro. Roads are followed where they are convenient, but going underground gives a certain freedom. Blue Line (Anjou Extension): From Saint Michael north-east to the new Galeries d'Anjou (a shopping mall). Five new stations, considered the top priority. Yellow Line (Longueil Extension) : From Longueil Université de Sherbrooke to Jaques-Cartier/Roland-Therrien (marked as Jacques-Cartier on my map). Four new stations, but the latest plan calls for six. Orange Line (Laval Extension) : The western 'leg' gets extended north-west and then north from Côte-Vertu to the new Carrefour Laval, with 7 stations. The eastern 'leg', currently terminating at Montmorency, gets extended west to meet it, with one intermediate station. The Green Line gets a minor extension to the north (east to Montréalers — their perception of direction is skewed). The area to the north, Montréal-Est (see, skewed!) is essentially an oil refinery, so the extension stops there. To the south, however, Lasalle is reasonably dense and has a store and shopping mall lined street (Boulevard Newman) so I've got 4 stations after the current terminus Angrignon, before the line heads north-west into Lachine. The Blue Line also gets only a minor extension past the current plans — and my Anjou station, by Boulevard Roi-Réne, is hardly original (the current 'planned' extension is a shortening of an earlier one). The other extension, south-west from Snowdon into NDG (aka Notre-Dame-de-Grâce) is also unoriginal — it was part of the original Blue Line plans, and the apparent abandonment of this still causes resentment among (English-speaking) 'West Islanders'. My own version pushes a bit further than the original though, past Montréal-Ouest (a commuter rail station), into Lachine. From the junction of my extended Blue and Green lines, at Lachine-Est, comes my own Maroon Line, the purpose of which is to reach the important Dorval Airport (aka Aéroport international Pierre-Elliott-Trudeau de Montréal), which has the Aéroport Trudeau station on my map. It is the 3rd busiest airport in Canada, so I was willing to go the extra mile — the Maroon Line has the largest gap between stations at 2.8 km. As for services, I am undecided — green line, blue line, separate, or some mix perhaps. The all new Red Line was inspired the the once-proposed Pie IX subway line. Montrél-Nord is a dense residential area with low-income families that needs better transit. However, I didn't want to just feed them onto the Blue and Green lines like the Pie IX proposal — there are already complaints about overcrowding. So I plotted out a direct route to downtown, and then I felt that downtown could use a cross-cutting line going at right angles. So to summarize, we have two branches in the north, designed to hit the most important areas in Montréal-Nord (and also pokes into Laval, to try and reduce traffic on the Pie IX bridge). They join in the middle of Saint-Leonard, and the combined line intersects with the Blue Line at Pie IX (I've called the station there Le Boulevard after the nearby shopping mall). Then head south-east and then south across the dense Plateau region, ignoring the street layout. The turn to the south-east more or less starts past the intersection with the Orange Line and my proposed Purple Line, and we cross the Green Line and again the Orange Line at right angles in the centre of downtown, before heading off the Pointe Saint-Charles and Nuns Island. The Yellow Line can currently be said to be a stubway, but an important once since the road bridges and tunnels over (and under) the St Lawrence are usually crammed. The Longueil extension makes it longer, but the single point where it connect to the rest of the network (Berri-UQAM) is somewhat overcrowded, so I'm following a long-standing proposal by extending the Yellow line further into downtown, curving around to reach the Green Line at McGill station. Past that point, however, are my own ideas — namely, pushing the line past McGill (still alongside the Green Line), and then heading out the other side of downtown in a new direction. The main destination is the neighbourhood of Côte St-Luc, reached via a northerly route that avoids the upper-class neighbourhoods of Westmount and Hampstead. Once near the Cavendish shopping mall, the line heads south (there is a cluster of high-rises in southern Côte-St-Luc, by the Westminster station). The final part of my Yellow Line there heads south-east to serve as an orbital, to connect the neighbourhoods (Lasalle, Montreat West, and Côte-St-Luc) directly via metro instead of having to go into downtown and out. I've also extended the Yellow Line in Longueil. The main target is here is the St-Hubert Airport, which currently is almost entirely for General Aviation, but is easily big enough to serve as a secondary airport for Montréal. The extension here assumes a new terminal will be developed on the southern side. The all-new Violet Line on my map combines 3 ideas. First, I thought the densest part of the 'South Shore', the Urban agglomeration of Longueuil needed an extra metro line, since the Yellow Line and it's proposed extensions just cover the northern part. One can call this the Shopping Line of the South shore, since from Quartier DIX30 until Greenfield Park, the route is designed to go from one Mall to another. The Line then heads west into Saint Lambert and then across the river. Second, the area in Saint-Laurent along Côte Vertu looked like a nice Metro Corridor, with 2 rail stations, large clusters of high rises, several schools, and a shopping mall at one end. I was bit nervy about it just being an orbital, adding more people onto the orange line, so I then remembered proposals for light rail running along Parc. So the middle portion of my Violet line runs from downtown, north-west in the general Parc/Mile End/Parc Extension area, crossing the blue line and then reaching Côte Vertu. Finally, I have an afterthought — the Brown Line. I'm not quite happy with this line. The general idea is that once we're done with the radials, you start with orbitals. The geography of Montréal does not encourage rings. Right-Angle Metros include the Blue Line and the Saint-Laurent part of the Violet Line, the western end has my extended Yellow Line to the south-west, but what about the north-east (east)? The old Pie IX metro proposal, which I discarded for my Red Line, would have provided that, so in the end I filled the gap with a short 'stubway'. 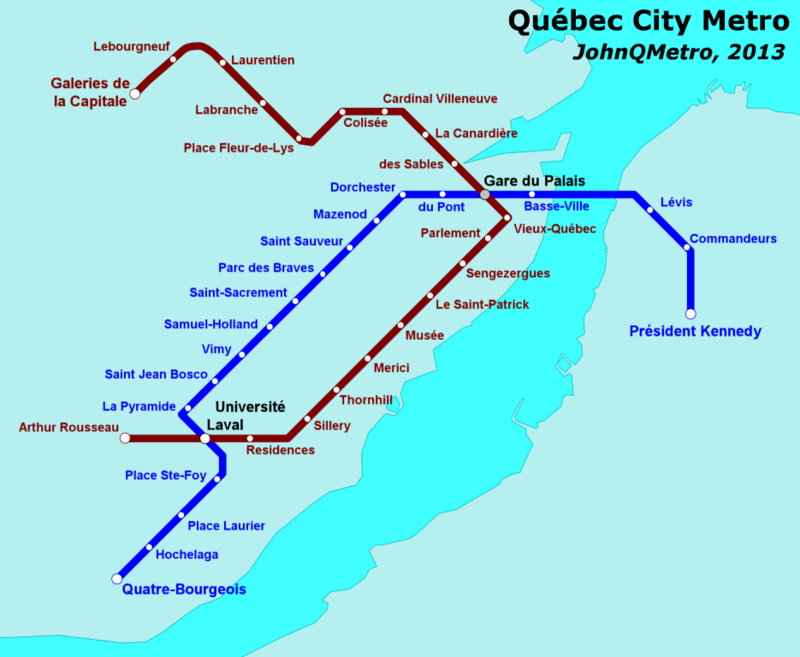 Québec, the capital of the Province of Québec (which was named for the city), has the second largest Metro area in the Province, at around 750 thousand. It also has no Rapid Transit or Commuter Rail of any sort, so this fantasy map is 100% my fancy. I assume that the 2 lines are underground and rubber-tyred — aside from possible savings by using Montréal Metro equipment, there is also the fact that Rubber-Tyred Metro can handle steeper grades, which I thought was vital for a city which has large parts on a plateau, and where I am also sending a line under a deep river. The Maroon Line handles what many people might think of as the most important parts of the city, the updown-downtown area along Grand Allée and into the heart of old Québec. In the west, the line heads through Laval University, to the east, after reaching Vieux-Québec, the line head down, north-west to the train station and across the Sant-Charles river into the densest neighbourhood of the area, Vieux-Limoileu. The target here is the Colisée (the Hockey Arena), which in the past was the home to the NHL team, and may be again once it is replaced with the new one (being built next to it). The route for the Maroon Line after that is designed to hit shopping areas — the population density is fairly low. The Blue Line picks up the areas missed by the Maroon Line. Probably the single most important part is that it heads under the St-Lawrence river downtown. Currently, people from Lévis across the river either have to take a ferry, or they have to head 12 km to the south-west, to cross the river. After that, the line stays below the cliffs to serve the port area, and the neighbourhoods between the plateau and the Saint-Charles River. After Saint-Sauveur station the line jogs to the south (not shown), and climbs under the plateau to continue south-west under Chemin Sainte-Foy, until the Laval University region is reached. Crossing that, the Blue Line finishes off by having stations at most important shopping malls in the area. I will note here that I decided not to try and reach the Airport. The terminal is around 6 to 7 km from the western ends of my metro here, and despite the Duplessis Mega-Centre to serve as an intermediate stop, the passenger traffic at the Airport seems too low to be worth going the distance. 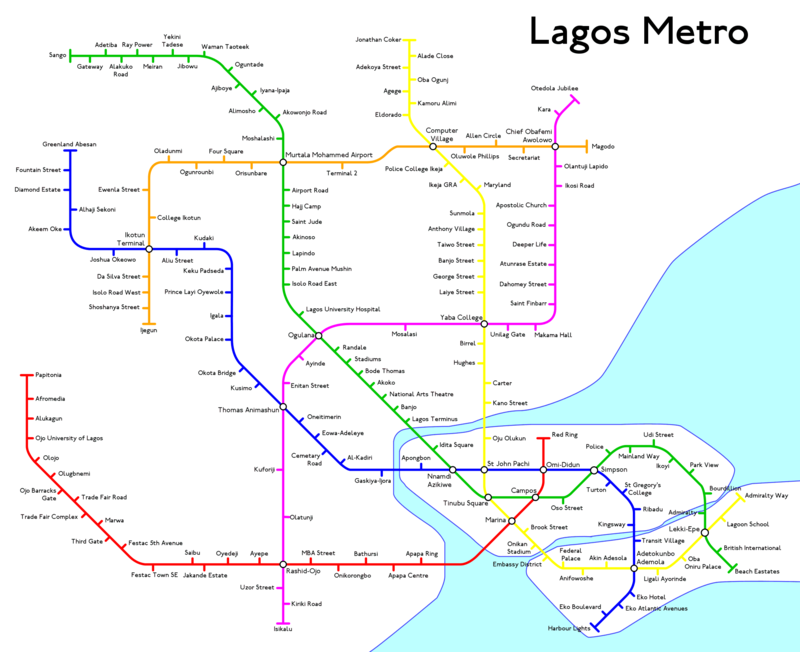 Lagos, the largest city in Nigeria, with a population of over 8 million, is, as of the time I plotted my fantasy map, the largest city in the world without metro rail. This is what inspired me to work out the map to the right. Unlike my Montréal and Québec maps, I do not try to be geographical. The city is currently planning an actual real metro, a 2 line Lagos Light Rail. The Blue Line will run elevated along surface highways (it's outer portions will follow the same route as my red line), while the Red Line will branch off and follow an existing rail line, currently underused, north by north-west. The plan is to use refurbished TTC subway cars as the rolling stock. My own routes ignore this, since I liked the idea of a 'from scratch' network. Also, as usual, I prefer to assume an underground (except where it is otherwise convenient) network, since trying to follow surface right-of-ways usually means the stations are not very conveniently placed, and I feel little need to skimp on fantasy money when doing a fantasy map. For Lagos, I assume the Metro will get higher ridership due to lower car ownership than a North American metro, and thus I did not try to drag out population density maps or look for apartment complexes or shopping malls (there are almost none) when plotting my routes. The station locations are mostly spaced out along routes intended to cover the city in general. Also, the relative lack of parks and parking lots means stations in the denser residential areas will require quite a bit of seizing and demolishing houses. The Red Line takes care of the south-west 'lobe' of Lagos, along the Lagos-Badagry Expressway. This is an area where an elevated line that follows a road is the most obvious and convenient route. However, further in to town (past the Jakande Estate station), I take the line underground and to the south. The residential neighbourhoods of Ajeromi-Ifelodun, and later Apapa, look like they need transit more than the factories/warehouses along the inner part of the Badagry Expressway. Finally the line heads underground into the western third of Lagos Island, the old downtown, from the south-west, and terminates there (after 3 intersection stations). One extra possibility is that this line could be quad-tracked for express and local services. The Blue Line is mostly intended to take care of the 'western lobes'. If you look at a Google Earth image of Lagos, you might notice that the 'spine' of mainland Lagos seems to run mostly north-south (trending towards the west), along the western side of Lagos Lagoon and north from there. To the west, aside from the Badagry 'finger', there are residential areas with irregular winding roads (no expressways), limited by swampy areas, that seem to 'grow' from the better-defined eastern spine. There are no expressway into town — but my Blue Line can provide a direct route. This is a 100% subway line since the above-ground roads are not wide enough (and twist too much). Once the more densely-packed parts of town are reached, the line heads south-east and then east onto Lagos Island. 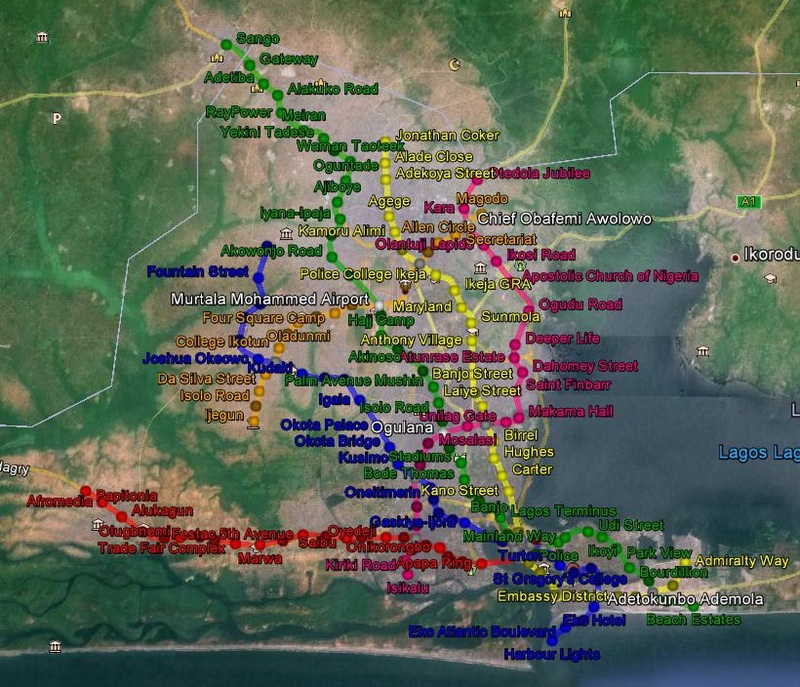 After some consideration, the southern part of middle Lagos Island are served by this line before turning south to connect to the Yellow Line on Victoria Island. I later pushed the line to the south-west after finding out about the Eko Atlantic project. My Green Line could be considered the most important line of all, connecting the airport, stadiums, and the northernmost areas of Lagos with downtown. It is also more centrally located. It's length also prompts me to think that this line should perhaps be 4 tracked to allow express services. The outer end of the line starts outside Lagos proper, in Ota, and follows the Abeokuta Express Way into town, probably elevated. The line heads underground between Ajiboye and Iyana-Ipaja stations, and has 3 further stations in the Alimosho area before heading under the grounds of Mohammed Murtala Airport. The line heads south-east and then south through the Mushin and Surulere areas. The Stadiums station is near the 2 biggest stadiums in Lagos. After that, the line generally follows Western Avenue/Eko Bridge, but heads east to the Lagos Terminus rail station before going onto Lagos Island. After the downtown, the line serves the north of the middle part of Lagos Island, and also eastern Lagos Island, before crossing to the Lekki Peninsula and terminating there by the coast. The Yellow line is the easternmost of the major radial routes. Large stretches of this line in the north follow roads, and thus could be elevated, but the line will still have to dip underground to take some corners, or in areas (like Agege) where the roads are too narrow. Starting along Iju road in the north, the line heads south through Agege, and then south-east through Ikeja and by Maryland before reaching Ikorodu Road and heading south. However, the line heads underground after George Street and trends east so Igobi and Yaba Colleges have stations. The Line generally follows Herbert Macalay Road after that, until it heads under the lagoon to Lagos Island right after Kano Street. Once passing through the downtown there, the Yellow Lines becomes the main route for Victoria Island, heading west to east, until terminating on the Lekki Peninsula. Of course, radial routes, in a big city, should be supplemented with orbitals, because many trips are not aimed to or from downtown. On my Fantasy map, the Magenta Line serves as the inner orbital, a semicircle connecting the 4 mainland radials around 6 to 7 km outwards from Lagos Island. This area was chosen because of the densely-packed residential areas more than anything else — also, the distance seemed right to me. The large orbital road (the Apapa Oworonshoki/Gbagada Expressway) is too far north. The Magenta Line has to be entirely underground here. However, in the north-east, after the line reaches Lagos University, I have the line turn north. Lagos becomes wider, so there I have the line turn into another radial, serving the Somoulu and Gbagada areas before becoming elevated along the Third Axial road. Finally, as another orbital, the Orange Line binds the north together. The eastern part of the line mostly follows Obafemi Awolowo Way, and I decided to make the airport the interchange station for the Green Line. The wide gap after that to the Blue Line means a large number of in-between stations serving Akowonjo and along Omo Boriowo Street. Past the Blue line, I decided to go onward along Ijagemo Road to provide stations for the area there. Winnipeg, the capitol of Manitoba, Canada, has around 750 thousand people. Currently it has completed the first segment of a separated BRT, the Southwest Transitway. It also once had a plan for a 3 line subway, dating from the 50's, that some are trying to revive. 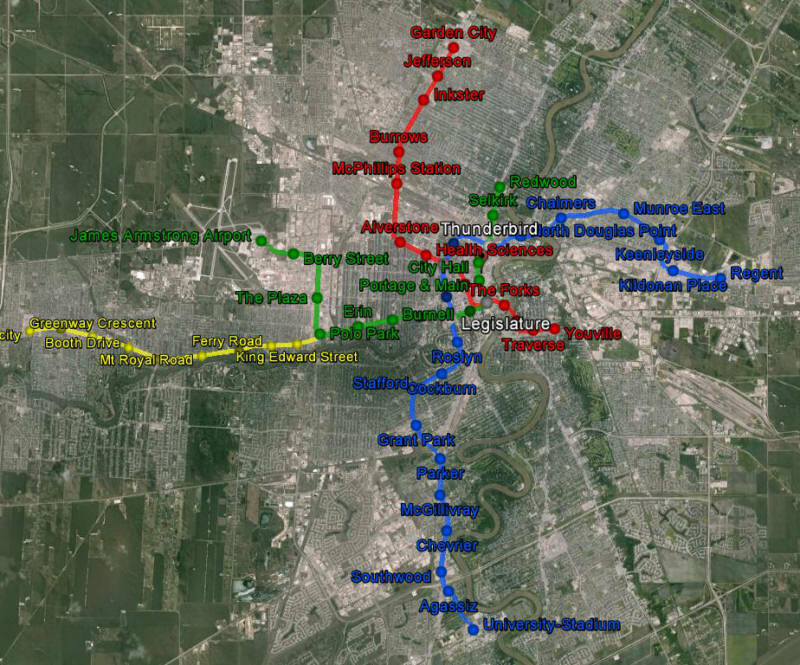 Others want something like the Calgary C-train, reaching the far corners of the city. My own map underwent quite a number of revisions! The is also the first map I've done which includes a non-grade separated line, the Yellow Line. The other 3 lines add up to around 45 km, which I felt was pushing it for a city under 1 million, but I still felt the west portage area was important. The Blue Line the longest by a considerable margin, starts in the far south, where the campus of the University of Manitoba is, and also where Bision Stadium, the recently completed Football Stadium and home of the Winnipeg Blue Bombers. The line heads north along University Crescent and then the central part of the Pembina Strip, where I assume the line will be elevated. North of Parker, the line departs the Pembina Highway and heads underground, because I felt the Grant Park shopping Mall and the residential areas (especially the Wellington Crescent area) were more important than the northern part of the Pembina Strip. After crossing the Assiniboine by the Osborne Street bridge, the line the skirts the western edge of the downtown core, and then heads east to cross the Red River. The 3 stations after that are for residentail areas, before the line heads south to reach the large shopping areas at and around Kildonan Place. The line could become elavated again by the time the station there is reached. The terminus is by the Regent Casino. The Red Line is mostly for the north-west of the city, a large residentail area. However, there is also the Garden City shopping area, which is fortunatly near the edge, so that is where the Red Line starts, heaving South-Southwest along McPhillips Street. The stations there are placed by intersections, since I think connecting Bus routes would give more boarders than on-foot passengers. The Northgate shopping mall is closest to Inkster station. Once McPhillips reaches its end, the line heads downtown along Notre-Dame, and once in the downtown area, south along Donald Street (with the MTS Station for Hockey fans), before turning east to intersect with the Green Line. 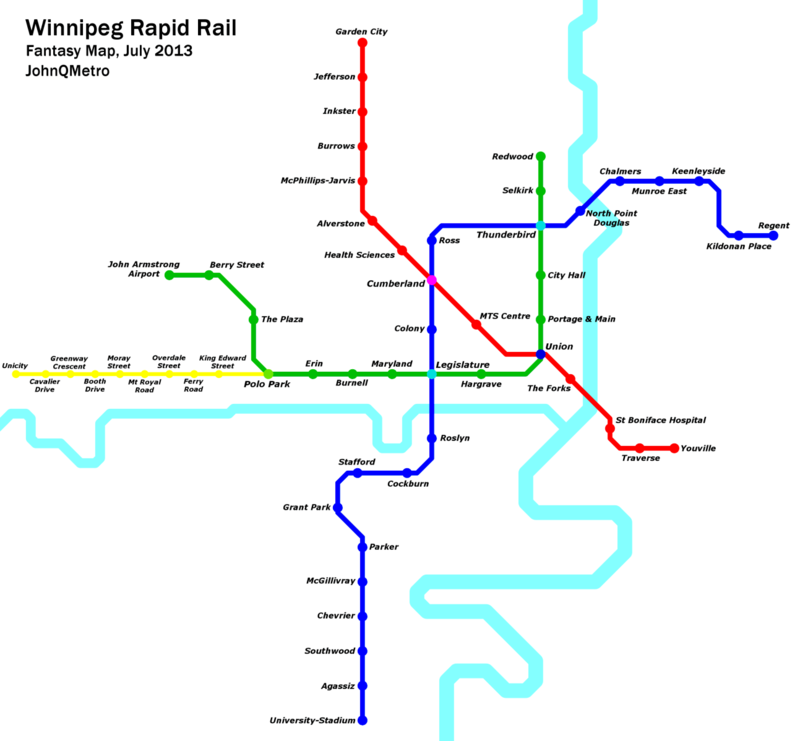 The is enough room before the Red River to have another station in The Forks (museaums, markets, and parks). St Boniface across the river is not very big, but it was enough for me to fit 3 stations. My Green Line connects the Airport (which is pretty close to the centre of town) to the downtown district, and runs mostly underground. I'm assuming the line is elevated at the Airport, and after Berry Street (serving the hotels and Airport Place), heads underground and south, before tuning to follow Portage and then Broadway into downtown. The line turns north at Main Street and stays on it until the end. The line could easily be extended past Redwood, but northern Main street does not seem all that developed. Finally, the Yellow line handles the western part of Portage, past Polo Place. I decided to make this line a at-grade LRT because western Portage seemed too important to ignore, but still lacked the large Shopping Malls and apartment blocks that are found along the other lines. Also, as mentioned before, I was worried about making the grade-separted metro network too extensive. It could just as easily be an elevated line, interlining with the Green east of Polo Place.